Klimenta will join the Montenegro National Team for a camp ahead of a friendly against Turkey on May 29. SACRAMENTO, Calif. (May 17, 2016) –Sacramento Republic FC defender Emrah Klimenta has been called up to the Montenegro National Team camp. Klimenta will join team in Podgorica, Montenegro on Friday, May 20 and stay with the team through their friendly against Turkey on May 29. This is the first time a Republic FC first team player has been called up to their respective national team. Republic FC has had seven academy players called-up to the United States, Guam and Canada Youth National Teams. Klimenta and the Montenegro National Team will play an exhibition match against a best 11 Montenegrin League team on May 25 and then will travel to Antalya, Turkey to play the Turkish National Team on May 29. Originally discovered during an open tryout prior to Republic FC’s inaugural season in 2014, Klimenta has started all eight of Republic FC’s USL matches this season, scoring a goal against LA Galaxy IIon May 7. Klimenta has played the most USL minutes (5,183) and appeared in the most USL matches (60) of any player in Republic FC franchise history. He also holds the club records for most consecutive USL (37) and all competition (33) appearances and all competition starts (23). Republic FC will begin their 2016 Lamar Hunt U.S. Open Cup campaign on Wednesday, May 18 when they take on CD Aguiluchos USA (NPSL) at Bonney Field. Kickoff is 7:30 p.m. 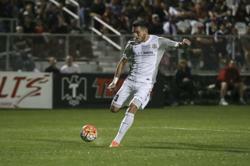 The match is a part of the Republic FC season ticket package. Single match tickets may be purchased at Ticketmaster.com.